This is my second order with this company. My last couple bobblehead turned out amazing. They communicated with me throughout the creating process and updated me with photos. Highly recommend! .. Most of our bobble head dolls are about 16-18cm( 6-7") tall when standing upright. We made real custom bobbleheads dolls with top quality polymer clay, the color is the nature color of the clay itself, no paint needed on the dolls, ensuring brighter color and more details on your bobbleheads dolls. We proudly offer FREE approvals in the different stages during the creation of your Custom bobbleheads. Changes can be made like making the nose wider or lips thinner - Untill your are 100% satisfied. During checkout, we will allow you to select the time you want the custom bobbleheads received in. 4.Ship within 5 days-no proofs. * FREE SHIPPING - when order $500+, ships within 3-4 weeks. 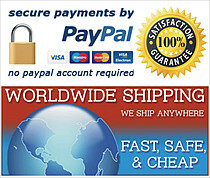 DHL / Fedex worldwide express shipping - The same cheap shipping cost to all worldwide cities. Charge may different base on the time frame you selected.